I am a big fan of Kyoto! I love everything they send out of their kitchen. On my first visit I ate almost all of their menu! Last winter I went back for their fantastic winter special which I have my fingers crossed to return this upcoming winter. This visit was about an update of what was new and a revisit of some old favourites! Every year Kyoto completely shuts down and they head out to find inspiration – this year they came back with Uni! Uni is also known as sea urchin and what you eat is the orange centre hidden in the spiky shells. The Kyoto Garden Sushi menu is huge and often makes ordering a little tricky. My best tip would be to not treat it like a traditional three course menu and order tastes and bites to make up a personalised dining experience. My second best tip is to chat to your waiter and let them suggest dishes and create the structure for you. With so many exciting dishes we often end up skipping the sushi. 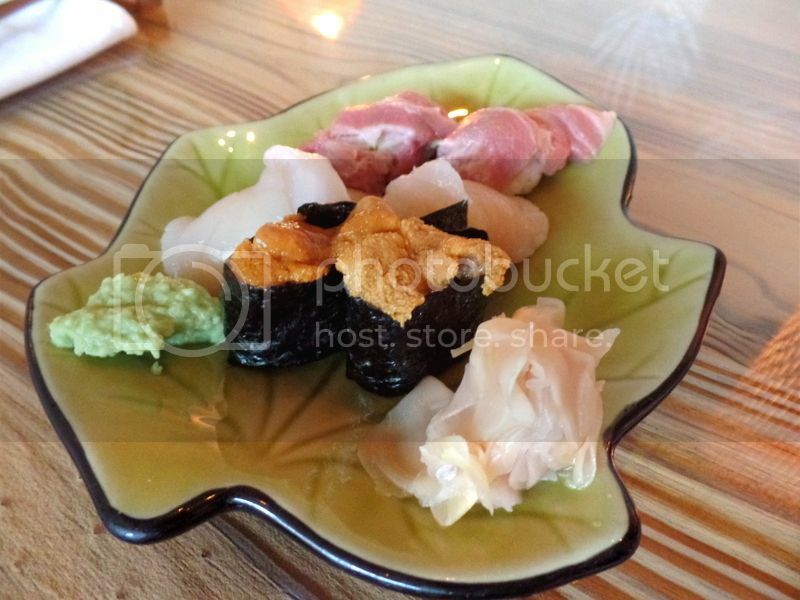 This time we started with a sushi platter to share and it was incredible! We ordered toro nigiri, scallop nigiri and uni maki. 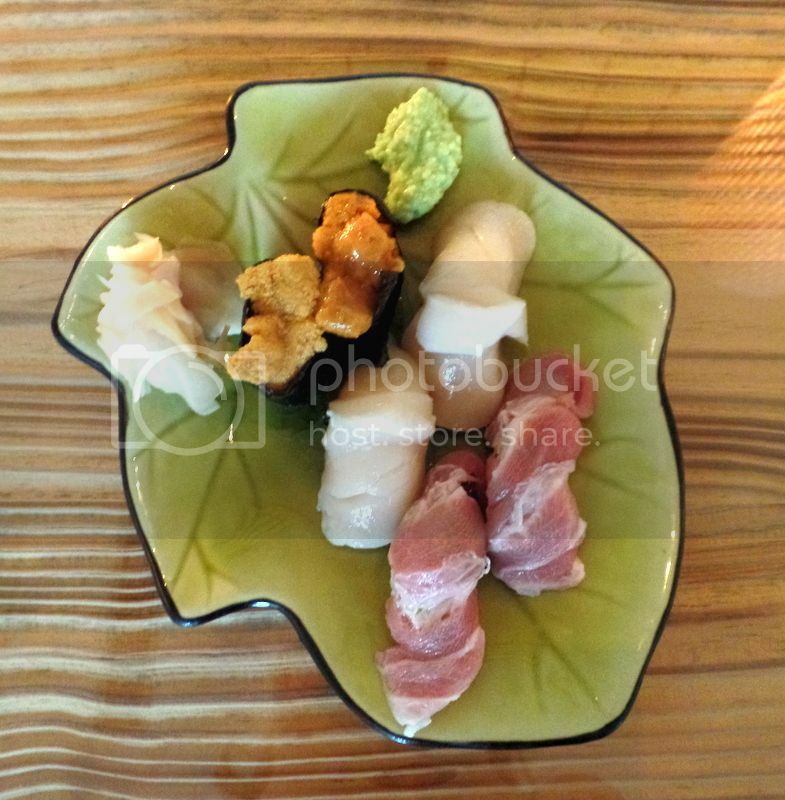 The uni maki is pretty expensive but a one of a kind experience for the true foodies. I don’t know of any other restaurant in Cape Town serving uni. This truly is a special and unique experience! I’m struggling to pin point the exact flavour because it really has no comparison but it is almost buttery and rich with a gorgeous earthy and salty flavour. If you were to make an ice cream out of all the flavours of the ocean this is probably what you would taste. That isn’t to say it is fishy – more meaty like tuna, scallops or crayfish. Its a tricky one to pin down but absolutely delicious and a flavour I highly enjoyed. I read somewhere once that uni tastes like kissing a mermaid. I really like that description and think they may be onto something! Two of my must orders every visit are the tuna tartare and the prawn tempura. These two dishes are always perfect and manage to hit all the right spots! They are fresh, clean and subtle with beautiful flavours! 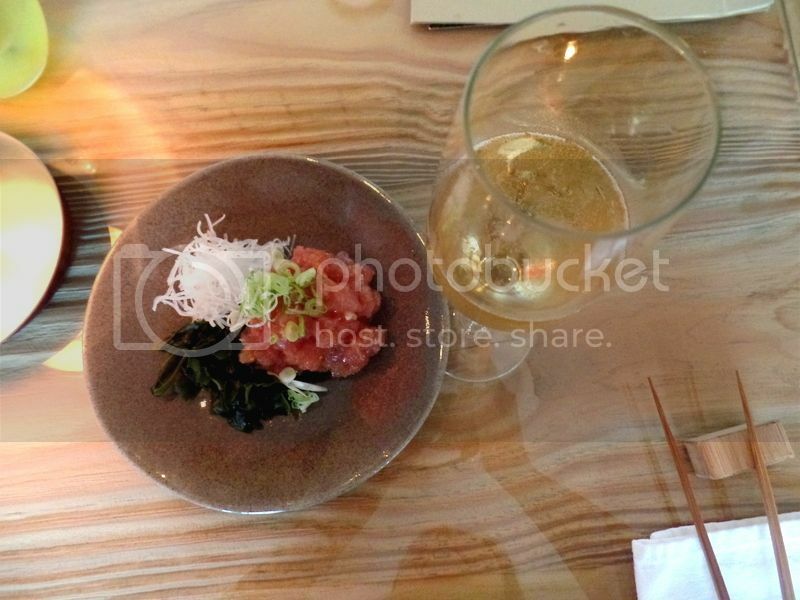 The tuna tartare is rich and creamy and is kept fresh with the spring onions! 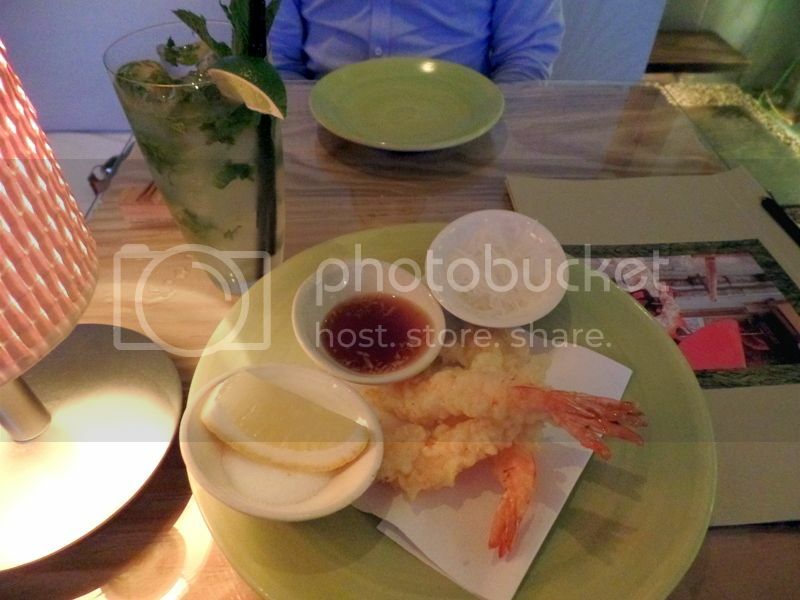 The prawn tempura is crunchy and crispy and is fantastic with salt and lemon juice! Kyoto is the proud creator of the very best tempura! I love the tempura prawns and the Asian tempura veggies are delicious too! If you’re looking for something different the squishy tempura scallops swimming in a salty sweet broth are really superb! Sadly the light started to fade as the evening went on and my photos aren’t as beautiful. Please know the food continued to be beautiful. 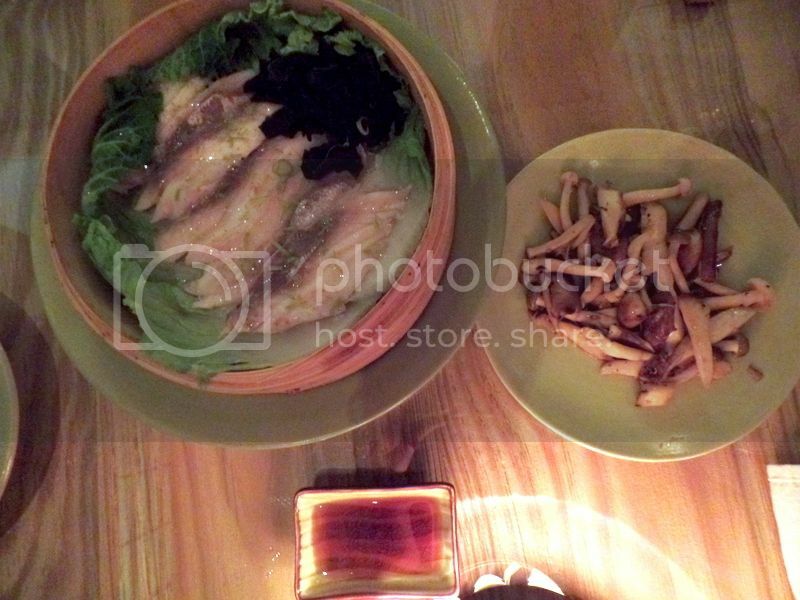 We tried the steamed fish in a bamboo pot which is lightly seasoned, moist and and tender. However, of all the dishes at Kyoto this is not a favourite. There are so many stand out dishes and this one just doesn’t deliver that flavour punch. If you’re looking for an amazing fish dish I would highly recommend their special fish with rice. The special fish is creamy and delicious!! I’m a huge mushroom fan and whenever we eat at Kyoto I always order a side of Japanese grilled mushrooms. Whatever you order – don’t miss out on the mushrooms! Its one of those simple dishes that really wows! We finished with ice cream! They really make fantastic ice cream with really special flavours! 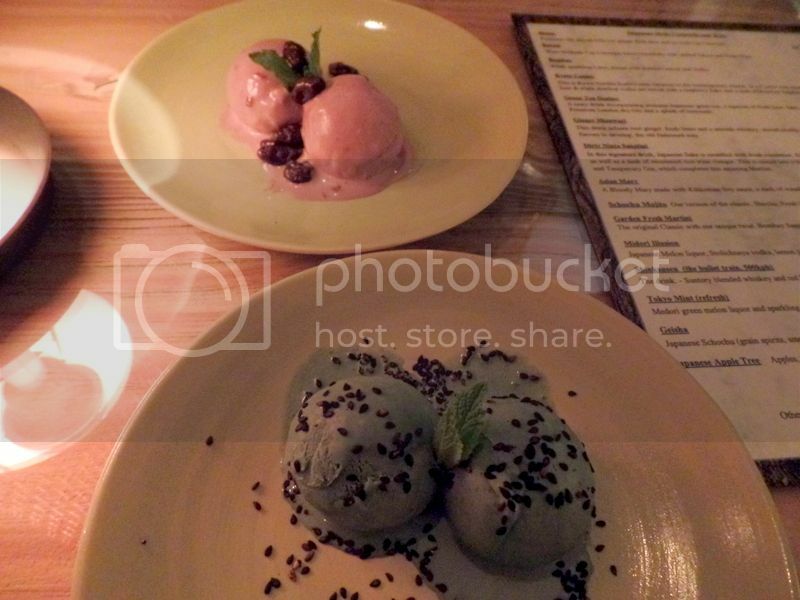 The pink one is cherry blosson ice cream with chocolate and the almost blue ice cream is black sesame seed ice cream! Kyoto had a lovely wine list and some great Japanese beers, whiskeys and sakes. However, my drink of choice at Kyoto is always off their cocktails list! One of my favourites is the Bonsai which is MCC with chilled Tahara and plum wine! Another big winner is the Kyoto Cosmo which is vodka, raspberry sake and gin! But really, close your eyes and point at the menu and you’ll pick a great cocktail! As always, I had a most perfect dinner at Kyoto. Make sure to visit them soon for foodie perfection! 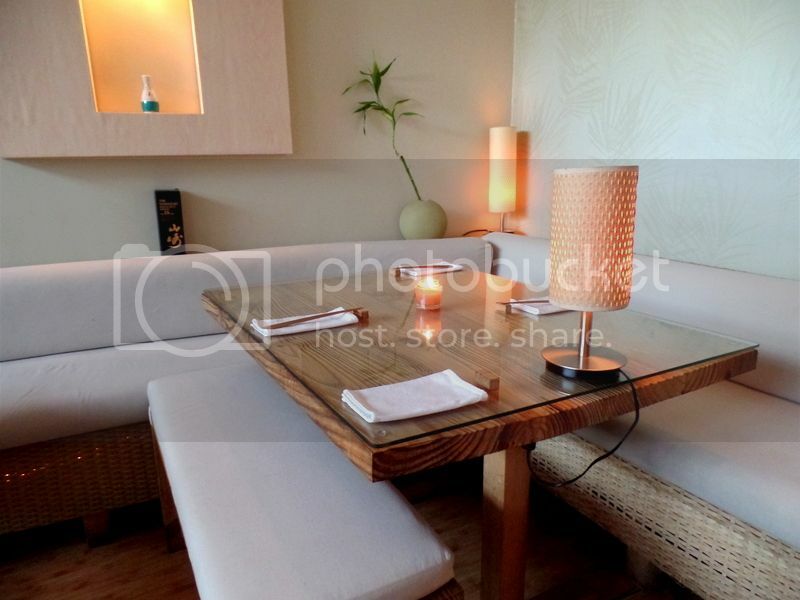 Disclaimer: We enjoyed our fantastic meal as guests of Kyoto Garden Sushi. However, all images and opinions are my own. Kyoto Garden Sushi Winter Special: Kyoto Garden Sushi Style Kyoto Garden Sushi: Set Menu for Two Kyoto Winter Special Back Again!